Alexa Hill, left, with her coach, Katie Van Hofwegen. 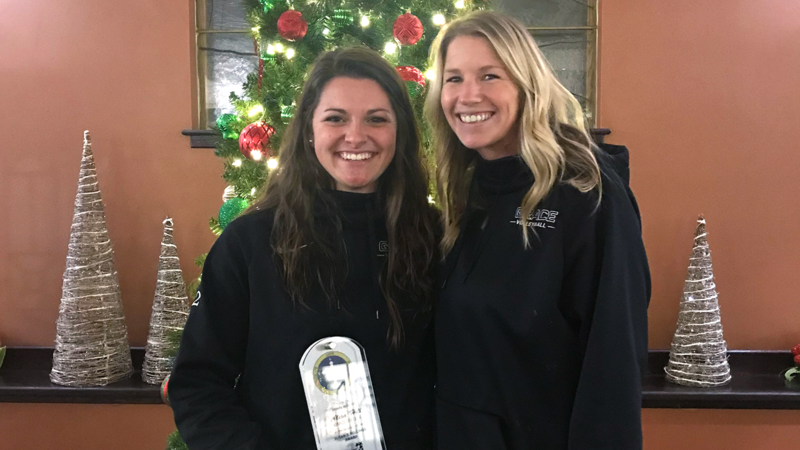 At the NCCAA National Volleyball Championship Banquet, Grace junior Alexa Hill was named the 2018 Susan R. Hellings Award winner. The Hellings Award is the highest individual honor handed out to volleyball student-athletes by the NCCAA, recognizing one individual each year for outstanding Christian character, athletic and academic achievement and community service. Hill is the fifth Lady Lancer to win the award, following Hannah Clemmons (2014), Rachel Bult (2011), Kate Millen (2000), and Marci Norris (1994). Hill has been a driving force behind Grace’s success for the past two years. Her gracious and humble nature serves as a perfect example for what it means to be a Christian student-athlete. Because of this, she is considered “one of the best teammates” that head coach Katie Van Hofwegen has ever coached. Hill’s unmatched work ethic and positive attitude allow her to be a pillar for her team, according to Van Hofwegen. The Huntington, Ind., native has received many athletic honors in her career. As a sophomore, she earned NAIA All-American Honorable Mention, NCCAA First Team All-American and also NCCAA/AVCA All-American. She currently ranks No. 6 in the NAIA in assists and eclipsed both 2,000 and 3,000 career assists this year. As of Wednesday, she has 3,029 career assists, which is 40 assists away from third place in program history. Hill has helped lead the Lady Lancers to a first round win in the Crossroads League Tournament in each of the past two seasons as well as a berth at NCCAA Nationals in 2017 and 2018. The pursuit of excellence goes far beyond the court for Hill. She holds a 3.98 GPA in elementary education. She works in the education department as an assistant and has served in leadership roles on mission trips.